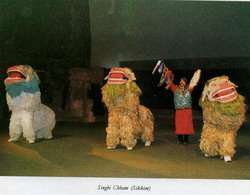 Singhi Chham: It is a masked dance of Sikkim, depicting snow lion - the cultural symbol of the state. (Snow lion was decreed the guardian deity of the people of Sikkim by Guru Padamsambhava). The third highest mountain in the world - Kanchenjunga(Khang-Chen Dzong Pa), standing sentinel over the state of Sikkim, is believed to resemble the legendary snow lion. The natives display their cultural symbol by dressing up in furry costumes and performing this majestic masked dance.